While I was on vacation I spent the sabbath day not in church (bad, I know) but on the beach with my family. And while I was feeling guilty (okay…only just a little) I started looking around to this very, very busy beach and all the families with small children. These families on vacation whose parents are wearing crosses. Now I don’t wear Christian themed jewelry, it’s just not my thing. I wear a wooden cross with my Easter Robe, it’s black cross with a white dove descending, “freeing” death from the cross, and I love the theological implications of it. There’s nothing wrong with wearing crosses, go for it. I have a few personal objections, which do not apply to anyone else. One, I don’t like the idea of anyone making a significant amount of money off of the symbol of my ultimate salvation and redemption, especially when I see diamond encrusted crosses. It reminds me of that scene in Indiana Jones and the Last Crusade where the Nazi picks the gold chalice and says, “this is the cup of a King” and then Indie picks the plain pottery one and says, “this is the cup of a carpenter.” Besides my theological cross I don’t wear wooden ones over gold ones, I just choose not to wear one. Second, and this is where I have gotten strange looks, so let me stress, this is how I feel about it for myself, not for you… I don’t like wearing a symbol of capital punishment. YES, my theology doesn’t see it that way. I know it is no longer a way of capital punishment and that after Jesus’ raising from the dead, that an empty cross is a sign of hope and redemption. Yes, I believe that. But I cannot help but look at an empty cross and feel the sorrow of the moment when Jesus was taken off the cross. This was driven home for me when I worked at Beulah Presbyterian Church and we would process in every Sunday morning. The balcony of the church hung low and there was a 10-12 foot cross in the front, that when you stood in the back of the church and walked forward you could not see the cross until you were clear of the balcony. Each Sunday I would watch that life-size cross slowly revealed as we walked forward. Each week as it came into full view I would think “THIS is where Jesus would have run screaming.”But once upon a time in a land called Jerusalem, he did not run screaming. I make the excuse that if Jesus would have been killed today we would be wearing injection needles or electric chairs around out necks. It’s a weak argument, maybe when you get down to it, I don’t wear a cross because I don’t feel worthy of the symbol, or maybe it really is just as simple as I chose not to. Not he could have gone to church that morning, or last night, or later that night. OR maybe he goes every Sunday but that one. 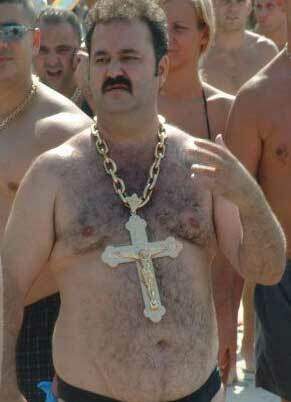 Maybe those families on the beach with crosses around their neck go to church every Sunday, and who am I to judge? I wasn’t in church, I was on the beach with my family too. And I wasn’t even witnessing to my faith through a cross necklace or tatoo. And here in lies my problem (this is where you think, “what was the point of that story?”) How do I witness to my faith? How do I witness for my church, how do I witness for my God? Is it through jewelry? And if so is wearing simply enough. Is my bumper sticker enough? Is asking people to pray for a friend on Facebook enough? And for those of us who don’t wear a symbol of our faith, or put a bumper sticker on my car- how do we work it into conversations. I mean don’t we want others to have this much love and passion in their lives? Don’t we want others to experience the hope and freedom as we do? I’m not talking about forcing and holding up signs on street corners. But if you do I beg that they be messages of love and not hate. But this blog updated it for today. Christ has no Facebook but yours, no Twitter, no online presence but yours. It’s genius, in my humble opinion, and I agree wholeheartedly. But I also wonder, if our online presence is our only witness, or our cross jewelry our only presence of Christ in the world then I don’t believe we are fulfilling the Great Commission. So how then? How do we witness to our faith, a liberating, exciting, love-filled faith? How do we do justice, love kindness, and walk humbly with our God in a real, life giving, way? When we will move beyond loving and witnessing about our churches only when we’re inside them, or only to each other? When will we find our way to reaching out beyond our walls, beyond our jewelry, beyond our computers? When will we connect with each other and share the good news where our whole lives reflect our faith? This entry was posted in Ministry and tagged church ministry, cross jewelry, evangelism, ministry, witness. Bookmark the permalink.